CST Inc, has created a new impressive PC RAm diagnostic tool, called DocMemory PRO PCI Test Card. The diagnostic software is factory installed on PCI Test Card and is self-booting which enable the PCI Test card to access the PC main memory at the lowest memory level possible. One of the nice features of DocMemory PRO PCI version 5 is its ability to display the DIMM memory configuration after the system boots up. The memory configuration which is found useful by non-technical users are : memory type ( DDR,DDR2 or DDR3), memory density and the finally the speed of the DIMM memory. It evens identify the CPU type and chipset information. 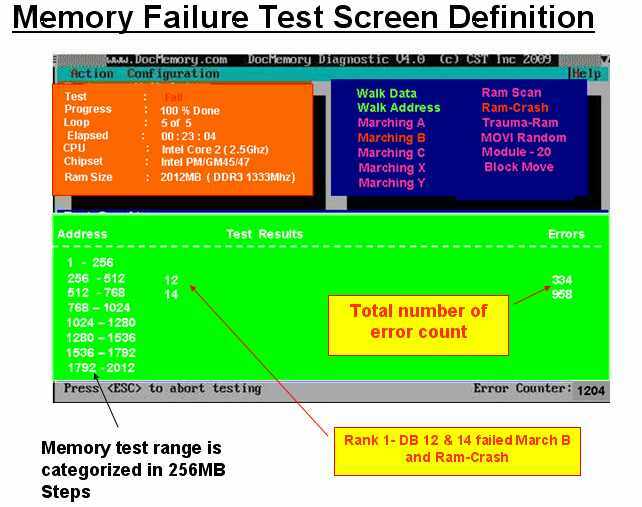 The above illustrations indicates a 2GB DDR3 1333Mhz DIMM detected by the DocMemory Diagnostic Software. DocMemory Pro PCI offers over 15 industry standard memory tests, including Walk data , Walk Address line, Mat-S, March A, B,C,X,Y, Mov-I, Ramscan, RamCrash,Trauma-Ram and more. DocMemory Pro V5.0 has three modes of operation - 'Quick', Detailed and 'Burnt-in' mode. DocMemory PRO PCI automatically starts in 'Quick' test mode. During our lab test, we tested numerous DDR2 and DDR3 modules that we have received from our customers that may have bad memory cells and confirmed with CST SP3000 and Eureka2 hardware tester), we were able to uncover many memory failures which are hard to detect. One of the cool features of DocMemory Pro PCI is that it can display the actual bad address and bad data-error. Most memory diagnostic program can only identify memory failures but it does not offfer an easy to use interface to pin-point the exact failure location. This bad-bit detection feature is very useful for QA/QC/RMA manager of any large memory manufacturer to catch errors for RMA repair purpose. The main limitation of DocMemory is that the DIMM memory module must operate at least well enough to boot-up, otherwise it will not be able to verify "No-Boot'"modules. 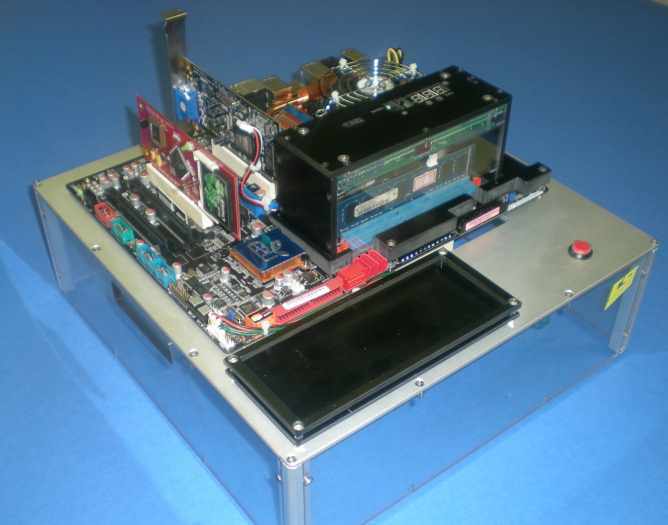 For this, you will need a CST hardware memory tester to do the job. DocMemory Pro PCI test card is very affordable and easy to operate.DocMemory Pro PCI card s a must for any PC technicians or PC system builders . Sample SPD Data of a 2GB DDR3 two rank SODIMM memory using x8 chips. CST feels that even the small memory retailers and small PC systems integrators using DocMemory Pro PCI for testing their module, will benefit by helping to reduce RMAs, and thereby improving customer satisfaction. One important feature which may benefit the small memory retailers is the SPD EEPROM reading capablility. 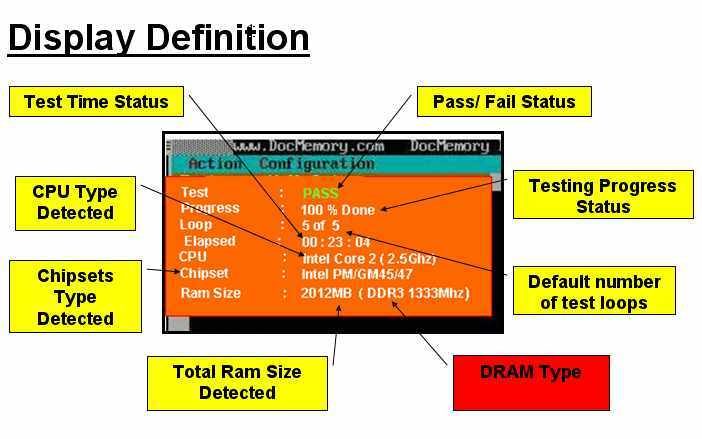 DocMemory is able to identify and display the SPD content of the DIMM while testing. 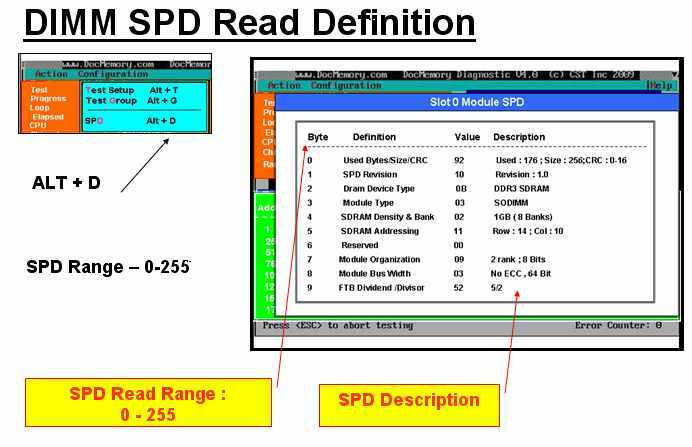 A trained technician will be able to identify if the DIMM module is a DIMM , SODIMM , No ranks used, and the chips configuration such as x4,x8 or x16 by just reading the SPD content. DocMemory Pro PCI is a must for all Memory Module Manufacturers, service technicians; large memory wholesalers and resellers will benefit from using this software. For more information on DocMemory Pro PCI Test Card, and other products. Call 972-2412662. View Video of DocMemory Pro PCI Test Card in action.